The SMTL physical testing department has recently completed a testing programme for the NWSSP Procurement Services (ProcS) Lymphoedema contract, working closely with Lymphoedema Network Wales. This was the second time SMTL and ProcS have undertaken this exercise, the first being in 2014 and most recently in 2018. The aim of the test programme was to standardise and rationalise the range of garments in use within NHS Wales whilst addressing a number of known quality issues (such as sizing) for lymphoedema garments identified by the clinical members of the group. Using this information, a performance specification was agreed with the lymphoedema specialists, based on average patients' leg and arm dimensions ProcS then grouped the different products into Lots, and manufacturers were then asked to supply appropriate off the shelf and made to measure garments to fit the selected patient's dimensions in specific Lots. Using these clinician-specified dimensions, SMTL set up their Hatra Mark 2 hosiery tester (specified in a number of British Standards) to mimic the size of these patients, and then undertook a programme to test the pressures exerted by the garments, and assess whether they complied with the specification. For the 2018 contract 6 manufacturers tendered garments for the various lots that SMTL would test. Only 2 out of 5 sets of upper limb garments (such as arm sleeves) and 17 out of 28 sets of lower limb garments (stockings) passed the pressure requirement specification, with most failures being due to pressures falling below the minimum compression level. Alongside testing for contracts, SMTL also investigates medical device defects and incidents for the NHS in Wales. When the contract process for lymphoedema was first started many clinicians were not aware of the defect process and dealt directly with manufacturers. However, since explaining the defect reporting process for medical devices to the lymphoedema clinicians in 2014, the SMTL has investigated over 150 incidents, with most reports being due to incorrect sizing, durability and manufacturing issues . The combination of a highly specified contract process and a well-publicised defect reporting system has lead to the number of defective garments dropping significantly, with only 10 incidents being reported to SMTL between January and August 2018. The success of this initiative has been resulted in the team winning two prestigious awards - the 2015 Government Opportunities (GO) "GO Procurement Innovation Award" and the 2016 "Procurement: Patient Safety Award" at the Patient Safety Congress (organised by the Health Service Journal and Nursing Times) where Dr Gavin Hughes and Louise Barry from SMTL were in attendance to receive the award. The Cross UK Partnership Group, a forum enabling regular dialogue between the devolved administrations and the Medicines and Healthcare Regulatory Agency (MHRA),held its latest meeting at Princess of Wales Hospital, Bridgend, in July 2018. SMTL represent Welsh Government on the Group for medical devices, and alongside Welsh Government's medicines experts gave a presentation to the group on medical device testing and procurement in Wales. After lunch, 10 members of the group including MHRA staff came for a tour of SMTL, where SMTL staff demonstrated some of the testing programmes currently underway, including testing of lymphodema stockings, pH papers for nasogastric tube placement, and gowns and drapes. Rebecca England, SMTL's environmental monitoring technician, took part in the Welsh 4 peaks challenge on the 9th June. 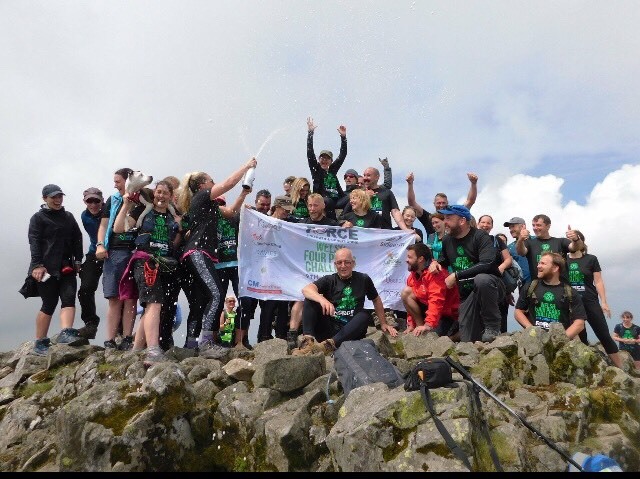 Rebecca and friends from the Force Gym walked up Snowdon, Cadair Idris, Pen Y Fan and finally Gwaelod Y Garth ! Rebecca is third from the left in the photo above. 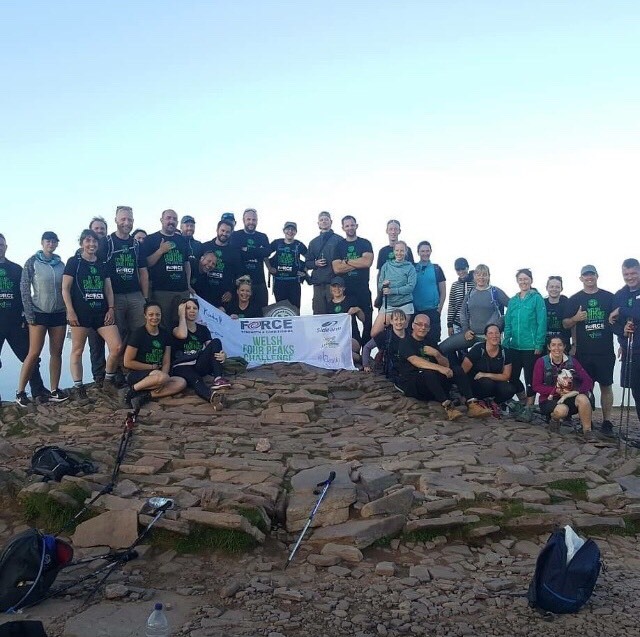 The aim was to raise money for Velindre cancer care, who had provided outstanding treatment to one of the gym members recently after being diagnosed with ovarian cancer shortly after giving birth to her first child. The full story of why they undertook the challenge is on the Just Giving site. All of us here at SMTL say 'well done' to Rebecca and the others at Force Gym for raising over £10,000 for VCC. All of us at SMTL are delighted to hear that Dr Steve Thomas, Director of the Surgical Materials Testing Laboratory (SMTL) from 1989 until 2005, has been awarded an OBE (Officer of the Order of the British Empire) for services to the NHS in the 2018 Queen\'s Birthday Honours. Steve studied pharmacy at Cardiff University followed by a PhD on gluteraldehyde. His initial post in the NHS was as QC Pharmacist for Mid Glamorgan Health Authority, where he started in 1970. As the laboratory grew Steve developed an interest in wound dressings and medical devices, and his expertise was recognised by the Welsh Office who appointed him as the Surgical Dressings QA Pharmacist for Wales. When the laboratory moved from East Glamorgan Hospital to Bridgend General Hospital in 1989, Steve became the first Director of SMTL. Steve is recognised internationally as a world expert on woundcare products, establishing the first NHS medical device and dressings testing lab in the UK for the Wesh Office. He has written over 150 papers and articles on surgical dressings, bandages and maggots and set up the first European sterile production centre for maggots used for wound debridement, reintroducing maggot debridement therapy to Europe, and turned this into a commercial venture which was spun off by the NHS as Zoobiotics in 2005 when Steve left the NHS. As Director of the Welsh NHS Surgical Materials Testing Laboratory (SMTL) he developed it into an internationally recognised leading centre for its work in on medical devices and surgical dressings. Steve was editorial advisor to the British National Formulary (BNF), founder member of the editorial board of the Journal of Wound Care, Senior editorial advisor to World Wide Wounds and editor of the Formulary of Wound Management Products. He developed the first performance-based test methods for modern wound- care products, which were adopted by the British Pharmacopoeia and the European Standards organisation CEN, as well as the test method used for over 30 years for bandages. He was long term member of Committee L of the British Pharmacopoeia, editorial advisor to MIMs as well as a member of multiple BSI and CEN standards committees. He was a twice winner of the Nicholas Award (Guild of Hospital Pharmacists), and in 2001 gained the Queen’s Award for Innovation for the LarvE project. In 2002 he was joint winner of the William Hunting Award (British Veterinary Association), again for his work with maggot therapy. After leaving Zoobiotics in 2007, he set up a medical device consultancy, Medetec, which continues to provide expert advice and consultancy to the dressings industry and the NHS in Wales. 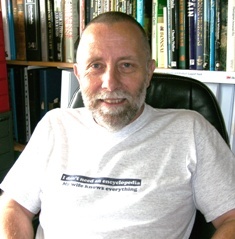 He published a number of recent papers on the effects of humidity on dressing performance and measurement of sub-garment pressure, which lead to the development of an apparatus used in the Welsh NHS as part of their evidence-based procurement programme, and which is under consideration for adoption as a UK standard. Steve continues to be relied on for advice to European Working Groups on dressings test methods, for indusry as an expert witness in legal cases, and has recently been commissioned by NHS Wales to produce Health Technology Assessments. He is the author of several patents related to dressings and maggot production and distribution. His 2010 book on “Surgical Dressings & Wound Management” is considered internationally to be the standard reference on dressings.